Lately we have been really into utilizing our ice cream freezer. Who knows if it's pregnancy or the summer that has brought on the ice cream cravings, but either way we have been making tons of homemade ice cream! We received our ice cream maker as a wedding gift and it goes down as one of our favorites. I highly recommend the make and model we have - so easy to use and it makes YUMMY frozen treats. For this Cuisinart model, it works best if you keep the freezer barrel in the freezer. That way it's always ready for the task of cranking out the cream. 1. Process strawberries in a blender or food processor until smooth, stopping to scrape down sides. (about 1 minute). Add buttermilk, sugar, and vanilla to puree; stir well until blended. Cover and chill 1 hour. 2. Pour strawberry mixture into freezer container of a 1 1/2 quart electric ice cream maker, and freeze according to the manufacturer's instructions. (times may vary, but mine takes about 30-35 minutes) Store the sorbet in an air-tight container in the freezer. Remove from the heat and stir in the semi-sweet chocolate until it's melted, then stir in the vanilla extract and the remaining 3/4 Cup of water. Transfer the mixture to a blender and blend for 15 seconds. Chill the mixture thoroughly, then freeze it in your ice cream maker according to the manufacturer's instructions. If the mixture has become too thick to pour into your machine, whisk it vigorously to thin it out. This sorbet may seem a bit runny after it's done in the ice cream freezer. Just put it in the freezer (in an air-tight container) for about an hour, to set. 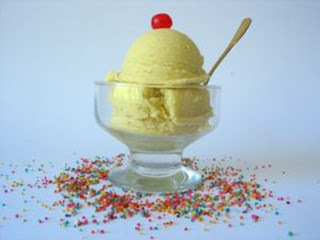 It will generally have a soft consistency and be easy to scoop and serve. This chocolate sorbet is especially yummy with a spoonful of peanut butter on the side. Like a rich and delicious peanut butter cup! In a medium bowl, use a hand mixer or a whisk to combine the milk and sugar until the sugar is dissolved, about 1-2 minutes on low speed. Stir in the heavy cream and peppermint extract. Turn machine on, pour mixture into freezer bowl through ingredient spout and let mix until thickened, about 25-30 minutes. Add the Oreos during the last 5 minutes of mixing. Store in an air-tight container in the freezer. we love ours too! I had one (a German brand) in Turkey and loved it! so I had to get one once I got back here!